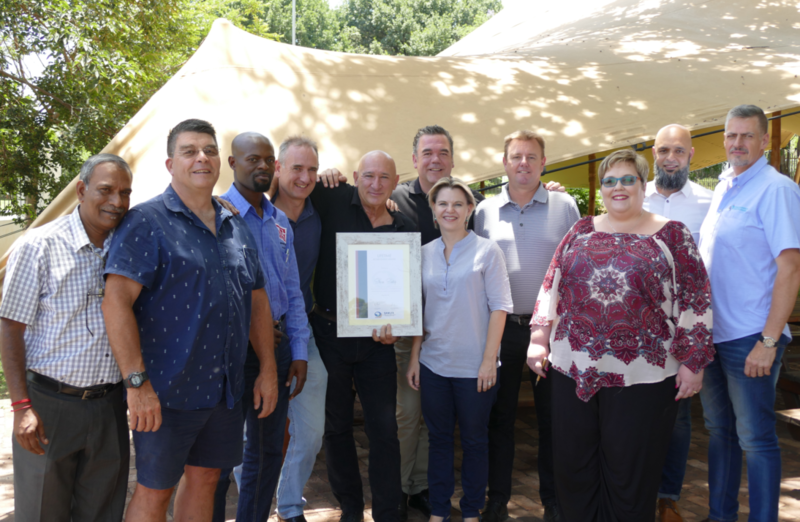 On 5 December 2018, the South African Wood and Laminate Flooring Association honoured Steven Suntup with a Lifetime Achievement Award at their executive meeting. Many people in the local flooring market regard Steven as a leader in engineered / solid wood flooring. His technical expertise in laminate, vinyl plank and engineered wood flooring, as well as the extent to which he has contributed to the industry as a whole, were the reason for him receiving the award. Steven is the third generation of a family rooted in the timber industry and he started his own company, Suntups Wooden Flooring, in 1989. The company imported, manufactured and installed floors, leading to Steven becoming a household name in the flooring trade in South Africa. Twenty years ago, Steven was invited to a meeting discussing the inception of what is today known as The Southern African Wood, Laminated and Flooring Association (SAWLFA). To his disappointment, the main topic was laminated flooring. He joined the National Wood Flooring Association in the USA and locally formed his own body, a Guild known as The South Africa Guild of Solid Wooden Flooring Installers (SAGSWFI). SAWLFA regularly knocked on Steven’s door for advice and guidance, leading him to join forces with the association where he served as Vice-Chairman for nine years and Chairman for the last four years. Some of Steven’s accomplishments include writing the South African Bureau of Standards specifications on wooden flooring, writing the technical installation training manuals for SAWLFA, as well as singlehandedly managing all the training and accreditation for SAWLFA installer members nationwide for around 10 years. Steven also wrote all modules for The Construction Education and Training Authority (CETA), relating to wooden flooring. In 2010, Steven was invited by Domotex China to give a speech on the wooden flooring industry in South Africa. Steven has spent most of his life teaching installers about correct installation methods based on his years of experience in the industry. He has always being available to anybody in need of assistance on site or via the phone. His dedication to ensuring the correct technical installation of wooden flooring has undoubtedly led to countless successful installations in South Africa. Steven has been a passionate presence in the wooden flooring sector for the past 30 years and FLOORS in Africa magazine would like to congratulate him on this significant award from SAWLFA. For more information, contact SAWLFA via www.sawlfa.co.za.